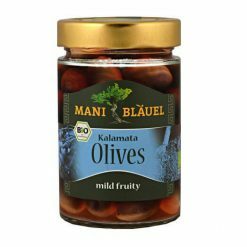 Organic, firm and unpitted, these delicious Kalamata olives are excellent on their own or in a wide variety of dishes, either raw or cooked. Mani Blduel supports the preservation of the physical and cultural landscape of Mani, helping in its establishment as the centre of GreeceEEs organic olive cultivation. All products are produced in close cooperation with organic farmers, who Mani BlÃ¤uel has supported for many years. The company has received a Fair Trade Certification from organic food labelling non-profit organisation Naturland. As part of this certificat”, Mani BlÃ¤uel follows seven principles: social responsibility, reliable trade relations, fair prices, regional supply of raw materials, collaborative quality assurance, community involvement and corporate strategy and transparency.